Family Research Council — To anyone who works closely on defense issue, it probably seems as if Congress just finished its work on the military’s appropriations. Already, the House and Senate are back to work drafting next year’s Defense Appropriations bill-and when they do, members aren’t about to let the DOD forget about the unfinished work they have to do to safeguard troops’ religious freedom. Yesterday, during a Senate Armed Services Committee hearing, Senator Mike Lee (R-Utah) pressed the Secretary of the Air Force Deborah Lee James for more clarity about why a cadet at the U.S. Air Force Academy had to remove a Bible verse from his personal white board. In recent weeks, the Air Force Academy Superintendent has suggested that the response was required by a two-year-old Air Force policy that limits Air Force leaders from expressing their faith out of fear that it might be objectionable to bystanders. 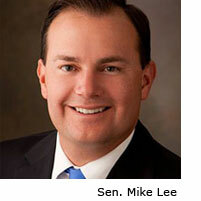 Senator Lee reminded Secretary James that this unusual and problematic Air Force policy has “significant ambiguities” and continues to be interpreted in such a way as to “run afoul” of last year’s Defense bill which requires DOD to accommodate individual expressions of belief even by military leaders. Secretary James responded that “when you read the policy on paper, it seems to make good sense… but I think what we’re perhaps learning is that in practice when you get down to the people who are the real people… there are gray areas… and are we doing the right thing or not?” She went on to make the announcement that Air Force officials will be convening this month to discuss existing Air Force policy on religious freedom and the need to bring it into line with current law. For those of us working to hold the Pentagon’s feet to the first, this is an important partial admission of the policy’s flaws, and a long overdue step from the Air Force. Of course, only time will tell if the Air Force will actually follow congressional intent and comply with the law. In the meantime, the “real people” Secretary James referenced continue to have a very real interest in practicing their values. Until the Air Force recognizes that even “on paper” existing policy has major legal problems, these men and women won’t be able to be confident in their ability to do so. Tony Perkins is president of the Washington, D.C.-based Family Research Council. He is a former member of the Louisiana legislature where he served for eight years, and he is recognized as a legislative pioneer for authoring measures like the nation’s first Covenant Marriage law.